Place the bird into your roasting pan. Add the wine and the broth. 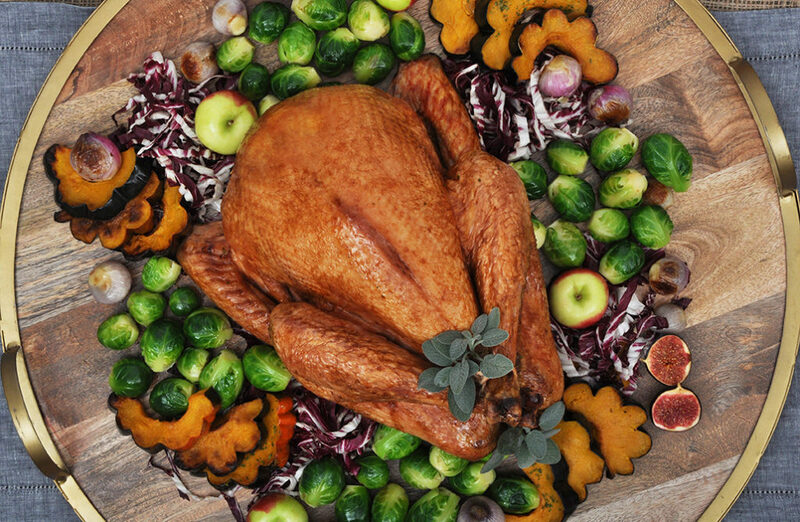 Roast the turkey for 4 – 4 ½ hours, until the juices run clear and an instant thermometer reads 170°F in the thigh. Generously apply glaze directly onto the turkey in the last 30 minutes of cooking. Return the turkey to the oven and then re-apply in the last five minutes of cooking. Bring to a simmer for 20 – 30 minutes until glaze is thick and syrupy. Remove fresh thyme stems and discard. If you are using a chunkier style of apple butter and you want a smoother glaze, use a hand blender to blend the glaze until smooth. Can be made up to 1 week ahead.